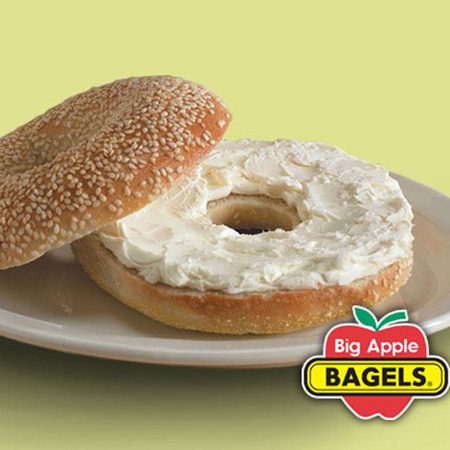 Big Apple can break the food selection down to bagels and muffins. From there, bagels can become sandwiches or be served as is, while muffins come in large and mini sizes. The place also has a selection of coffees and smoothies. The highest calories per dollar item is the Large Carrot Cake Muffin. The highest protein per dollar item is the MFM Cheddar Twist. If you have to choose between a muffin or bagel, go large muffin for calories and bagels for protein. The MFM cheddar Twist is our Efficiency pick for best item to order. If you are eating out, you can save thousands of dollars a year learning our Nutrient Per Dollar List. Or keep eating out and optimize with our huge restaurant per dollar list.